Before you groan, “Not another silly national day,” please allow me to take just a moment and explain what Skip the Straw Day is all about. In the 1880s, inventor and philanthropist Marvin Chester Stone (1842 – 1899) created the first “modern” drinking straw. Drinking straws have been in use since the Sumerian civilization, the oldest known example being a golden tube found in a tomb dated to approximately 3000 BCE. It was believed to have been used to avoid fermentation sediments while drinking beer. In South America a sieve-like device called a bombilla, used for drinking mate tea, has been in use for hundreds of years. During the 19th century, natural rye grass straws (hence the name) came into common use in the United States, but these added a “grassy” flavor to the drink. For that reason Stone invented the “modern” straw, first experimenting with rolled paper and then paraffin-wax coated Manila paper. In the 1960s plastic straws began to be manufactured. It is estimated that today over 500 million plastic drinking straws are used daily in the United States. That’s a lot of plastic. Inevitably, some of those plastic drinking straws end up in the environment. Plastics are especially harmful to oceanic ecosystems, where due to currents they tend to collect into what are called “gyres.” According to the National Skip a Straw Day webpage, “straws and other plastics cause harm to marine life in many ways. Birds, fish, and other sea life consume plastics accidentally or when they mistake it for food. Plastics don’t biodegrade. They break down into smaller and finer, microscopic pieces. When plastics break down, they produce bisphenol A (BPA) which interferes with reproductive systems in marine life. It also produces styrene monomer which is a suspected carcinogen.” A group of activists called The Coral Keepers, comprised of students at Whitehall Middle School in Whitehall, Michigan (along with their advisor, Susan Tate) “founded National Skip the Straw Day in 2017 to encourage Americans to give up the straw habit and help spread awareness about the damage caused by disposable plastics.” The Registrar at National Day Calendar declared the day to be observed annually on the fourth Friday in February. While it may not be an official national holiday, it is a great way to bring awareness to the harm plastics are causing in the environment. “What does this have to do with books?” you may ask. A fair question, which I thank you for asking. 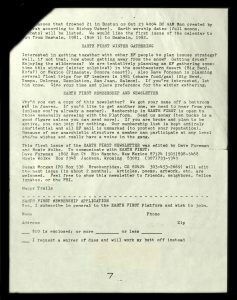 Environmental activist groups have been around for a long time. One of the most important things these groups do is to bring awareness to the problem. One way in which these organizations accomplish this is through publication, commonly via newsletter. 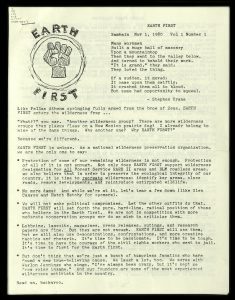 An excellent example of one such environmental advocacy group that emerged in the southwest United States in 1980 is Earth First! The founders (Dave Foreman, Mike Roselle, Howie Wolke, Bart Koehler, and Ron Kezar) were inspired by – yes, you guessed it – books. 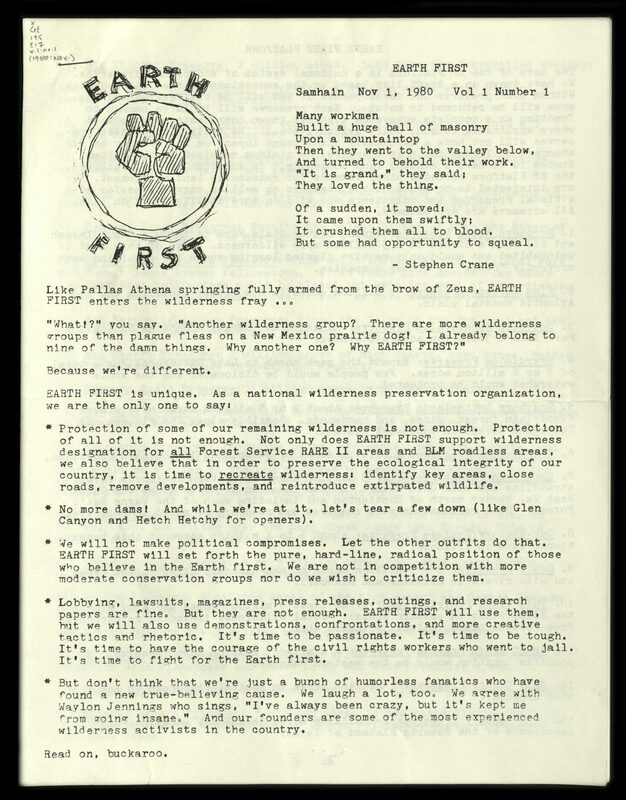 The founders of this specific organization were inspired by Rachel Carson’s Silent Spring (1962), Aldo Leopold’s “Land Ethic” (the final essay in the 1949 A Sand County Almanac), and Edward Abbey’s The Monkey Wrench Gang (1975). The Earth First! organization is known for its radical activism, characterized by public stunts. Edward Abbey, revered by those who were part of the movement, spoke often at early organization gatherings. 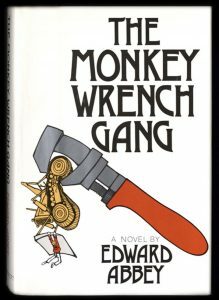 Edward Paul Abbey (January 29, 1927 – March 14, 1989) was an American author and essayist noted for his advocacy of environmental issues, criticism of public land policies, and anarchist political views. 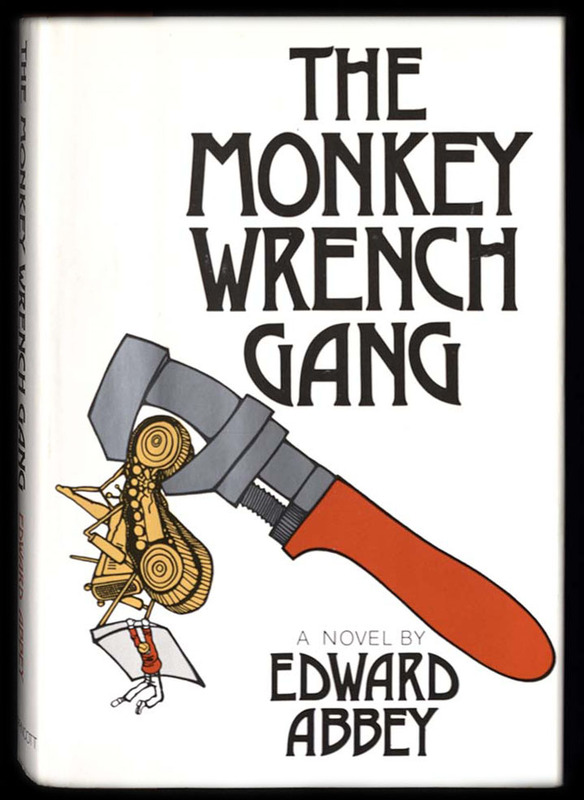 In addition to The Monkey Wrench Gang (1975), he wrote The Brave Cowboy (1956) and Desert Solitaire: A Season in the Wilderness (1968). Abbey was born in Indiana, Pennsylvania, graduating from high school there in 1945. Eight months before his 18th birthday, when he would become eligible for the draft into the United States military, Abbey decided to explore the American southwest. He traveled by foot, bus, hitchhiking, and freight train hopping. During this trip he fell in love with the desert country of the Four Corners region. In the military Abbey had applied for a clerk typist position but instead served two years as a military police officer in Italy. Abbey was promoted in the military twice, but then demoted twice due to his propensity for opposing authority, before being honorably discharged as a private. His experience with the military left him with a distrust for large institutions and regulations. This influenced his writing for the duration of his career and strengthened his anarchist beliefs. When he returned from Italy to the United States at the end of his military service, Abbey took advantage of the G.I. Bill and attended the University of New Mexico. He received a B.A. in philosophy and English in 1951 and a master’s degree in philosophy in 1956. While an undergraduate, Abbey was the editor of a student newspaper in which he published an article titled “Some Implications of Anarchy.” A cover quotation of the article stated, “Man will never be free until the last king is strangled with the entrails of the last priest.” University officials seized all of the copies of the issue and removed Abbey from the editorship of the paper. After graduating, Abbey traveled to Edinburgh, Scotland, where he spent a year at Edinburgh University as a Fulbright scholar. In 1956 and 1957, Abbey worked as a seasonal ranger for the United States National Park Service at Arches National Monument (now a national park), near the town of Moab, Utah. In the 1960s Abbey worked as a seasonal park ranger at Organ Pipe Cactus National Monument, on the border of Arizona and Mexico. 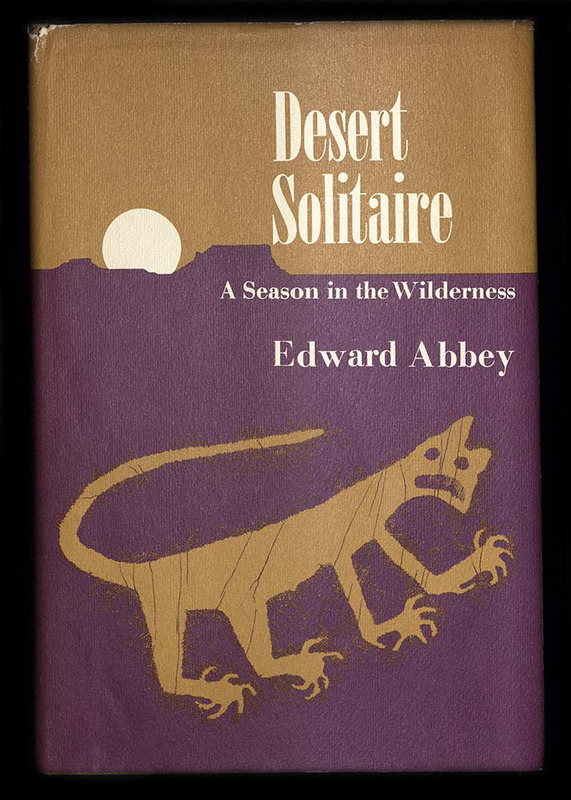 Desert Solitaire, Abbey’s fourth book and first non-fiction work, was published in February 1968. This year marks the 50th anniversary of its publication. Desert Solitaire is regarded as one of the finest nature narratives in American literature, and has been compared to Thoreau’s Walden. In it, he recounts his stay in the canyonlands of southeastern Utah from 1956-1957. Abbey vividly describes the physical landscapes of Southern Utah and delights in his isolation as a back country park ranger, recounting adventures in the nearby canyon country and mountains. He also attacks what he terms the “industrial tourism” and resulting development in the national parks (“national parking lots”), rails against the Glen Canyon Dam, and comments on various other subjects. So in observance of National Skip the Straw Day let’s all sip our beverages from the rim of the cup and perhaps take a look at the Earth First! 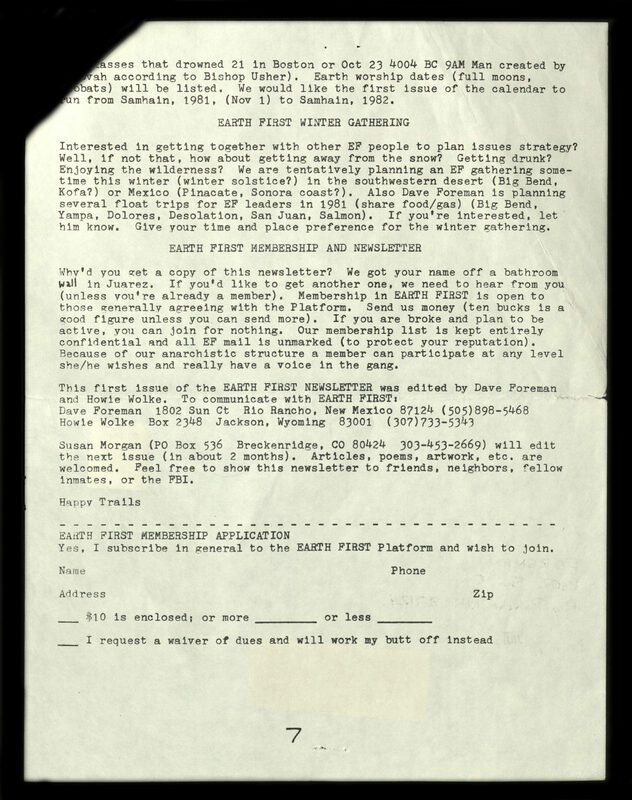 newsletter and The Monkey Wrench Gang or Desert Solitaire. I believe that Edward Abbey and the founders of Earth First would be happy to know that today, thanks to The Coral Keepers, we are adding a few less plastic straws to the landfills and ocean gyres.